Originally conceived and tied by Frank Sawyer MBE, an English River Keeper, the Pheasant Tail Nymph is one of the oldest nymph patterns. Frank devised the pattern for use on the chalkstreams of Southern England and to imitate several species of the Baetis family, generally referred to as the 'olives'. It quickly became world famous and various different versions have appeared - All of which are included in this selection. 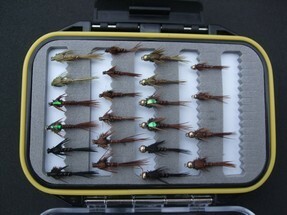 22 flies in 8 patterns and 3 sizes.